Dewsbury Keep Our NHS Public invites everyone to JOIN THEM on Saturday 25th July in sunny Dewsbury, from 11am – 4pm at Dewsbury Women’s Centre, (men are welcome :)), 7 Wellington St. WF13 1LY, where Dr Anna Athow (retired Consultant Surgeon & BMA member) will give a presentation on NHS England’s Five Year Forward Plan – so that we know what we’re dealing with. There will be lots of opportunities to ask questions and discuss what these proposals mean to the hospitals, community and public health services and GP surgeries in our areas – as well as gaining an understanding of what is happening nationally. “WE ARE CALLING ON AS MANY OF YOU AS POSSIBLE to come and equip yourself to challenge what will be the last nail in the NHS coffin – if the privatisers have their way. make our own Forward Plans! number(s) by Saturday 4th July (yes – irony intended!). If we don’t hear from you by then, we will assume that you can’t make it. and – crucially perhaps- before that, president of the global health division of UnitedHealth Group, the biggest US private health insurance company. Optum, a subsidiary of United Health, is now gobbling up NHS contracts. And Spinwatch revealed that United Health chaired and funded the NHS England’s secretive Commissioning Support Industry Group. 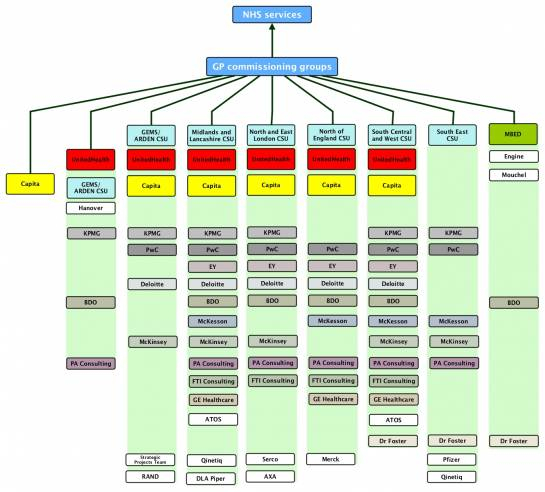 This brought together the usual management consultancy suspects and private health companies to plan for the future of support services for GPs (sold off to Capita a couple of days ago) and the privatisation of the Commissioning Support Units in 2016 (approved contractors and suppliers in the diagram below). Simon Stevens joined UnitedHealth through the revolving door between government and private health care companies that whizzed him out of his job advising the New Labour government on NHS privatisation. From 1997 to 2001, he had advised the first two New Labour health secretaries, Frank Dobson and Alan Milburn and from 2001 to 2004 he worked with Tony Blair in 10 Downing Street. While working for the New Labour government, Stevens co-authored the 2000 NHS Plan with New Labour Health Secretary Alan Milburn (who later jumped ship to work for companies that promote and profit from NHS privatisation – both at Bridgepoint Capital and as as Chair of PwC’s UK Health Industry Oversight Board, which aims to shake up the NHS and create a “health market” that PwC can profit from). The 2000 NHS Plan promoted more private sector involvement in the NHS: a greater role for competition in the NHS, getting private companies to provide some services, and expanding the Private Finance Initiative (PFI) to fund the construction of new hospitals. Simon Stevens also praised the Coalition government’s 2012 Health & Social Care Act, which has speeded up and extended the NHS privatisation that the new Labour government set in motion. What is NHS England’s Five Year Forward View? open the door to its complete privatisation. View so far. According to Calderdale Clinical Commissioning Group’s Chief Officer Dr Matt Walsh, this is the “paragon” that others including West Yorkshire Clinical Commissioning Groups and local authorities are going to follow. We need to defend the NHS as never before. This entry was posted in News & views by jenny. Bookmark the permalink.